Most of us are aware that the CTTP-2007 report had recommended a Commuter /Sub-urban rail system for the city, totalling 204.0km (this includes city & suburban services upto Tumkur, Hosur & Ramanagaram). A few sub-urban trains are in operation & are being run by Southwestern railways (SWR), but the system is not of much help to urban commuters. Please also see earlier discussions on this subject here, here & more recently here. a) On Kengeri-City Stn route: (23) near RV Engg College; (24) Deepanjali Nagar Metro stn; (25) Hosahalli main rd. b) On City Stn-Whitefield route: (26) Seshadripuram (Sivananda store); (27) Jeevanahalli; (28) Beniganahalli (ORR); (29) Devasandra; (30) Hoodi; (31) Sadarmangal Ind Area. c) On City Stn-Baiyyappanahalli route: (32) Jalahalli (ORR); (33) MS Ramiah rd; (34) Gundappa rd; (35) Kanaka nagar; (36) Kadugondanahalli. d) On Banaswadi-BMA boundary route: (37) Beniganahalli (ORR); (38) Kaggadasapura; (39) Chinnappanahalli; (40) Varthur rd; (41) Sarjapura rd; (42) Chandapura (Hosur rd). These additional stations would reduce the average distance between stations to about 2.3km, which is more appropriate for a suburban rail system. SWR might have it's reasons for repeatedly rejecting operation of city rail services in Bangalore - such rail systems are faring poorly in almost every city in the country barring Mumbai, but then in India, city rail systems are directly being operated by divisions of Indian railways whose primary focus area is the operation of inter-city train services. Further, the other transport systems in use in the cities (such as buses, taxis, etc.) were never planned nor integrated for easy transfer of passengers between different modes. Each operated independently on it's own, sometimes even competing with one another & making commuting difficult for people. Thus, most cities continue to have transport systems that are not well-knit & therefore, inefficient, & this also explains why city rail systems have fared so poorly in the country. We now have a situation where SWR has a lot of assets such as tracks, real estate & stations, but is clearly not the best option to build & operate the city /suburban rail system. It might be best if BMRCL could become the operator for CRS, sharing the infrastructure with SWR. Submitted by idontspam on 15 February 2010 - 4:10am. To a query on the Railways providing circular railway service for Bangalore city utilising the existing track network and building some more, Mr. Muniyappa said the Ministry has been watching the infrastructure development in the city. “We have been watching and studying the public transport scenario in Bangalore. I’ll not make any commitment at present but definitely we are at it,” he said. Submitted by Sanjeev on 15 February 2010 - 11:09am. Its good that now awarness is coming with people about CRS & how its important to integarte CRS with METRO & BMTC. I think too much of discussion on CRS at every level, but no action from any front. Its fate of Banglore and Citizens to suffer on the CRS front for some more time : . Even when RITES took study on CRS on behalf of BMLTA, they did't consult SWR officers, SWR wants to do its own study as evident from BMLTA meetings. Then comes MOS Mr K H Muniyaap ( due respect to his efforts for Karnataka ) making statement that State is not yet decided on CRS, so the Bangalore-Whitefield-Krishnarajapuram track-quadrupling work could not be implemented Now SWR wants study the traffic voloume on Yesvanthpur to Devanahalli to start Local Trains. Even RITEs study is not accepted by SWR & it looks for shorter roots of 7 Kms length similar to Mono Rail. We at Praja need to work with all these inputs and make strong representation to SWR & Minister K H Muniyaapa / Chief Minister or Transport Minister. Other wise we will be discussing on this even for next 2-3 years. Its time for us to act on CRS to get the things on the ground going. Submitted by idontspam on 15 February 2010 - 12:27pm. Are SWR tracks in B'lore over-loaded ? Submitted by Naveen on 15 February 2010 - 10:25pm. Secundarabad Jn - 58 (Many passing thro' trains). It indeed appears that the load in /around Bangalore is higher than other larger cities in the south viz. Chennai & Hyderabad. Tracks in Chennai radiate independent of one another from one of two central points (ie. Chennai Central & Beach). This makes it easier to slot suburban trains inbetween intercity trains & run them with lesser interference since there are no criss-crosses. Likewise, in Hyderabad, suburban trains are being run along existing train tracks that do not have intersections with other tracks. Thus it appears that they are being run without interference from crossing inter-city trains (ie. by slotting them inbetween two inter-city trains along the same tracks). In Bangalore, we have many line intersections or bifurcations such as those near Yasavantapur, Yelahanka, Lottegollahalli & Banaswadi. Also, in addition, we have the 'tangle' of tracks between Byappanahalli, KRPuram & Chennasandra - I think all these make it more problematic to run regular suburban trains since halting for inter-city trains to cross will probably become a routine for every CRS /Suburban train. Rail track arrangements appear to be similar to our diffuse road system. With all these negatives, it might be better to leave SW tracks for inter-city & the few suburban services & develop a whole new (elevated or underground) system of separate, independent tracks for Metro & Monorail. I think that having regular /frequent city /suburban trains on existing tracks (with simultaneous operation of so many inter-city trains - increasing all the time) might be quite difficult. Submitted by ss87 on 15 February 2010 - 10:39pm. It is not tough to run suburban trains though the number of trains arriving/departing are more. An analysis reveals many trains arriving/departing between 5 and 7AM.After the departure of 6731 to MYsore and arrival of Rani chennamma and Tirupathy Fast pass there isnt much fo train traffic until Seshadri arrives at 12:30. Again after 2PM there is not much traffic present until departure of Kacheguda Express at 18:20 after which teh station fills to the brim. But in the mornign peak hour and evening peak hour many locals can be run. Some adjustments can be made in this regard. 2785/86 Kacheguda Express generally stops at PF-2 for whole day. This can be taken to the yard to relieve this platform. An expansion of the last platforms to the binny mill land and accommodate trains that side. Trains like 6525/26 Kanniyakumari come onto the platform by around 7PM for departure at 9:45PM. t can come around 9PM. Karnataka Express is also put onto Pf-1 at around 5:45MP for around 7:20PM. Submitted by idontspam on 15 February 2010 - 11:41pm. Which might indicate there is a need to create alternate terminals like this and then connect them via the locals to the city. That apart we have the habit of running point to point trains from every city to every other city. There is no concept of change overs. Is it time for trains also to be direction based? Submitted by Sanjeev on 16 February 2010 - 9:26am. Load on Bangalore city tracks is not much considering the length of existing track and direction of tracks running. Its mis-managed by SWR and not having right infrastucture for the Banalore city railway tracks. Take the case of Pune Local Trains running upto Lonavala with double electrified Track. Same track is used to for Mumbai Travel & its one of busy section. 1. SWR has managed the Tracks & electric lines in Bangalore city to run trains for Bihar, WB & Chennai not for the Bangalore city. 3. Trains starting from SBC to Mysore can be started from Yelahanka via Yesvanthpur & SBC. For this why Railway minister has not bothered to develop Yelahanka Station with SIX platfroms. 4. For all your information, Tracks from Yesvanthpur to Lottegollahalli looks double, SWR has ensured that one track rund for Yelahanka & other track runs for Hebbal / Banaswadi. They should have created junction at Lottegollahalli which would have given double / 4 lane track from Yesvanthpur. Its 4 Kms. 5. Till this day by giving all execuses by SWR or State Govt or Center, we have allowed to run all types of Long distance trains during 6AM -10AM & evening 4PM to 8PM. Now stand is tracks are over loaded. 6. When all Major cities have 4 Tracks to their central place with fully electrified, its ensured that we need to fight for Bangalore. on this Take the case of Yesvanthpur to Yelahanka, Yesvanthpur to BaiyyappanahaliI, KR Puram to Yelahanka, still tTrack doubling need to be done. 7. From SBC to Kengeri, Whitefiled, Chikbanavar, Yelahanka Four Tracks need to be provided with electric line, when will Railway minister sanctions this ????? 8. BaiyyappanahaliI, to Yesvanthpur, hardly few trains running, its not used much. 9. Now take the case of Yesvanthpur to Nelamangala track which was ready more then a year, ( state has invested the money in this ) till this day starting of trains is not talked. With above details, CRS can be easily put into SWR tracks. Their is no issue on this. Its matter of action not the disussion. Submitted by vlnarayan on 16 February 2010 - 11:22am. All Mysore bound trains to start from Whitefield/ KR puram ( Via BANGALORE CY JN, SBC). All trains towards Bangarpet - Chennai & Hosur to start from Yeshwantpur( Via BANGALORE CY JN, SBC). All trains towards upwards North to start from Kengeri ( Via BANGALORE CY JN, SBC). Local trains with adequate frequency between all these stations via BANGALORE CY JN, SBC will take all the incoming or outgoing passengers very easily. Neither the state govt nor the SWR is interested due to vested interests of each inspite of many requests from public. 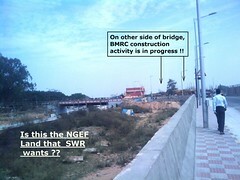 SWR (Now) is no better than SR (Yester years) for Bangalore - Ultimately Bangalore is still crying for CRS and suffering. Submitted by Naveen on 16 February 2010 - 3:37pm. My point was that the layout of tracks in Bangalore (as per map above) is somewhat complicated when compared with track layouts in other cities, which adds to the problem for running a CRS here. See maps of track layouts for Chennai & Pune below - these are much simpler than what we have in Bangalore. I think the point made for shifting starting stations for inter-city trains away from SBC to clear up congestion is valid & can help a great deal, but I doubt if SWR alone can take such decisions - they might need concurrence from IR. Also, for electrification of tracks, I think IR has to release funds out of the budget to have it done. I doubt if SWR alone can go ahead without concurrence from IR - this might be the obstacle. The recent announcement makes clear that Byappanahalli will also be developed to another hub /terminal since Metro rail will integrate there. Maybe we will see some action then. Submitted by idontspam on 16 February 2010 - 4:16pm. My point was that the layout of tracks in Bangalore (as per map above) is somewhat complicated when compared with track layouts in other cities, which adds to the problem for running a CRS here. But, thats what makes it circular and more appropriate for Bangalore. It covers more areas that metro doesnt so we can make metro focus on the uncovered areas instead. SWR/IR should use Yeswantpur & Byappanahalli as terminals for interstates since they will have multimodal connectivity soon. This should free up other stations for Bangalore Circular. Long term move to BIA can happen for commuter trains which connect BIA catchment area. Submitted by Sanjeev on 16 February 2010 - 5:09pm. Track length of Bangalore is higher then any other city & reaches to most of the places.s in Bangalore except the Jayanagar & Banashankari. Infact its an advantage for CRS to start, if any one has travelled in Mumbai Local Trains, they have built Railway FLY-OVERS for Railway Track to Criss-Cross so that direct connectivity from differnet directions exists. 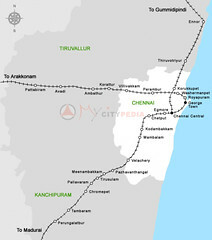 Compared to other METROs, Mumbai, Kolkotta & Chennai have dead end terminals where Inter City Trains / Passanger Trains takes very high time for turnout, its almost double time, arrival trains to reach platform, then drive in reverse direction, then once gain when departure again they need to bring the Train to platform. In case of Bangalore, Hyderbad, Pune, Hubli-Dharwad, Tracks runs in different directions without any dead end. 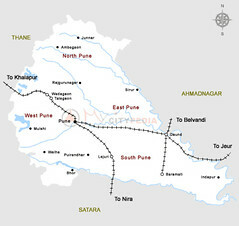 Take the case of Pune, their are hardly few trains which originate from Pune city, most of the trains are crossing city only, hence the track availabilty is very high in Pune, so they ar able to run Local Trains & advantage is they have fully electrified length. 6. Local Trains can be stationed at Kengeri, Nelamanagala, Devanhalli, Anekal, Whitefiled for night halt. 7. As the Track in Bangalore Criss-Crosses, this is an advantage which will help in better planning of Inter-city Trains & Local Trains for CRS. 8. BEML can supply the Broad Guage CRS coaches as per the design of Delhi METRO which is based on Broad Guage. 9. Already Binny Mill Land handing over to Railways in progress, so the Bangalore Central will have more Platforms for Local Trains. 10. BAIYYAPPANAHALI station need to be developed on urgent basis without any further execuses. This will help in originating more Inter-City Trains. With all this, State will initiate or Center / SWR. Submitted by Naveen on 16 February 2010 - 6:30pm. Okay - I understand that the complicated track layout in Bangalore can actually be an advantage & can in fact be very helpful to organize running an excellent CRS since various areas can be connected much better & more easily than in other cities such as Chennai & Hyderabad. 1) Develop Byappanahalli as a new greenfield terminal. As per railway minister's statement, SWR is awaiting transfer of NGEF land, though I noticed heavy construction activity adjacent to the existing Byappanahalli station platform - see pictures below. 2) Shift starting points for as many trains as possible out from SBC to terminals that are furthest from the respective train destinations, such as Mysore trains to start from Byappanahalli /Yelahanka; Chennai trains to start from Yeswantapur /Kengeri; North bound trains to start from Kengeri /Byappanahalli, etc. since this will also negate the need for everyone to come to the city to board inter-city trains. I'm not sure why BEML should be part of any SPV for a CRS. To me, BMRC would be best since they would then be in-charge of all city trains (Metro & CRS) & be in a good position to organize all trains for best interconnectivity, scheduling, etc & to complement one another. Submitted by idontspam on 16 February 2010 - 8:24pm. I am not too sure we can create so many terminals, it may become a logistical nightmare for interstate travellers to change trains. But definitely Yeswantpur & Byappanahalli will be a good start for terminating trains. City station should continue to host transit traffic. Submitted by Naveen on 16 February 2010 - 9:18pm. We already have KRPuram & Yeswantapur as terminals. 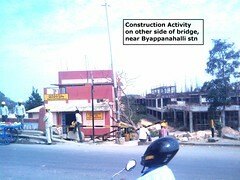 Byappanahalli is also being added. At least these could be used easily as start points for most trains (thereby reducing load considerably on SBC). Travellers will not need to change any trains. If at all, their travel will become more convenient. For example, a train bound for Mysore will commence from Yeswantapur or KRPuram instead of SBC. Those who reside closer to Yeswantapur & KRPuram will be benefited & will not need to go to SBC. The train will, however, stop at SBC en-route to pick up other passengers. As regards NGEF land, this plan makes it clear as to what Mr Muniyappa was talking about. It is the factory land on the northwest of tracks (portions on the northeast are earmarked for KSRTC & BMTC, whilst the land south of tracks is for Metro depot). Submitted by silkboard on 16 February 2010 - 10:23pm. Augment capacity of tracks in the city, additional tracks basically, just like BBMP widens the roads. Or, IMHO better option, create new terminals at the edge or sub-urban entrance to the city. Use the freedup capacity to run commuter rails. These edge stations (or lets use a new term, suburban terminals) would need further connectivity with other interior parts of the city, and that would come via the Commuter Rail itself. It would be just like how, to go to Vashi/New Mumbai, you go to Kurla or VT, and then take Harbour line commuter train to Vashi. The suburban terminal option will help to better manage some other movement patterns as well. Like, a Terminal on the North Side near BIAL will increase BIAL's catchment, and will provide connectivity to the airport from city as well. If Satellite Bus stations could be placed adjacent to the suburban terminals, Train to bus exchange pattern would get decentralized, currently, most of it happens predominently at one place, Majestic. did someone say there is no space? Well, remember, there is enough air space available over many railway stations in the city. Submitted by s_yajaman on 16 February 2010 - 11:02pm. Edge terminals at BYP (Metro Stn next door), YPR (Metro station) and somewhere near Nayandahalli should be the order of the day. People don't travel to Delhi and Chennai on a daily basis by train. Commuter rail will enable tracks inside the city to be utilized for more than the 100,000 or so using it today. Naveen, your idea is good, but it eats up track capacity. One commuter stretch could be Mysore Road to BYP via SBC and BNC. One could be from YPR to Mysore Road. One could be from SBC to E-City via Carmelaram? Submitted by vinod_shankar on 16 February 2010 - 11:42pm. Assume metro phase-I is complete, in which case we'll have metro running between nayandhalli to majestic to byapanahalli. So it makes perfect sense to convert nayandanahalli and byapanahalli as terminal stations for long distance trains. Also from my daily commute i have observed there is enough land available from cantonment railway station to whitefield station to quadrapule the lines, which will increase capacity. And also the the quadrapuling project was approved way back in 1997(src:vision document indian railways). Why is it a project approved in 1997 hasn't made any progress, not even a murmur. To me it seems CRS is inevitable, its only a matter of time. The sooner the better else people will start using long distance trains for urban commute. How about making a point by travelling in trains on a designated day? Lets call it a "commuter train day".. Submitted by Sanjeev on 17 February 2010 - 9:14am. Edge stations will really help the CRS. : Yesvanthpur, Byapanahalli, KR Puram, Kengeri, Yelahanka. More edge station will help the de-congest inter-city trains & to create parking yard for the Inter-city trains to halt. Coming to Harbour line for Local Train to Vashi, Belapur, Panvel, With such good project example in front of Railway & Govt, it looks some vested interest acting against CRS, reason CRS will not benifit the some Western companies in getting ordere as the supply of coaches & tracks will be done by ICF Chennai or BEML ( if possible ). This facility was created way back 1992-94, and station designs at Vashi, Belapur, Nerul, Panvel are really good, even stations are maintained very well and I have not seen any such Model station even after 16-18 year down the lane. These stations have all facilities : Office space for IT companies, Helipad on the top floor, Conference hall with Exhibition center, Underpass for the road trafic, Parking space for Private vechile on both sides, Bus yard for the local buses, Railway reservation center, these facilites were created 16-18 years back. Belapur, Vashi, Panvel, Nerul stations concept can be replicated to certain extent for Yelahanka, Byapanahalli,, Yesvanthpur, Lottegollahalli, Kengeri, Chikkabanavara, Gnanabharti, Bellandur Rd, Karmelaram, Whitefiled, Devanhalli, Malleshwaram, Canonment as mention by Pranav : there is enough air space available over many railway stations in the city. Land also is availbale for most these stations for expanding. COMMUTER TRAIN DAY is a required to get the CRS as mentioned by Vinod. How do we push for CRS ? Submitted by Naveen on 17 February 2010 - 10:36am. We already have established edge stations at Yesvantapur & KRPuram. As of now, I think KRPuram sees only one train that does not enter the city (6613 - Rajkot Coimbatore Exp). Yesvantapur has helped in reducing load at SBC, since people from north bangalore prefer to board trains there. Likewise, people from east prefer boarding at Cantonment, if the train passes & stops there. Byappanahalli will also be added as an edge station & will help to further reduce traffic to & from SBC. I don't think the suggestion to have inter-city train terminals far outside the city (similar to airport/s) will work since the type & number of users is very different. Inter-city trains are also a sort of "mass-transit" between cities & the number of travellers is huge & uncomparable with the number of air travellers. This is why we have train stations in almost all world cities closer to city centers than airports. Examples include Penn & Grand Central in the heart of Manhattan, St.Pancras & Waterloo in London Central, Hautpbahnhof in Berlin Central, etc. The Metro alone will not be able to provide connectivity to inter-city train terminals. A CRS will certainly help, & for this, augmentation of lines is vital. How do we push for this ? Vinod makes the point for a "Commuter train day", but with so very few users, most would be unaware first up, but maybe this is one way to start. Submitted by idontspam on 17 February 2010 - 10:38am. Well, remember, there is enough air space available over many railway stations in the city. Good point, I heard airspace is being provided over roads as well in Hyderabad as TDR. We still build single level and underexploit multilevel advantage.Over all railway stations a bus stand can be built with ramps to the road. Submitted by n on 17 February 2010 - 10:10pm. There seems to be adequate interest for a commuter rail day type event to occur. Is SWR necessary for CRS ? Submitted by Naveen on 17 February 2010 - 10:49pm. I'm just as curious. As far as commuter rails in other cities are concerned, all of them are being run by Railway divisions (Delhi suburban rail is run by NR, Kolkata by ER & SER, Mumbai by WR & CR; Chennai by SR, Hyderabad by SCR, etc.). As discussed earlier on this thread, CRS is said to be a state subject & not with SWR or IR. What this probably means is that the state must also participate financially to build & run the service. For eg. the state of AP & SCR contributed equally for Hyderabad MMTS, but it is being run by SCR. Thus, the state govt has to push for CRS, if they need one. The reason why railways participate in the project is probably because they do not want to part with their assets (tracks, land, etc. ), & so, they might have tended to insist on operation & participation, atleast thus far. Submitted by silkboard on 18 February 2010 - 1:10am. 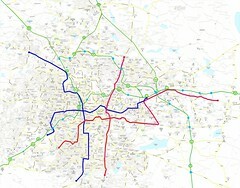 Thought of recycling this old image, though Metro Ph 2 routes are likely to change, and BRT may not happen as well, the pic gives an idea of possibilities using CRS. Submitted by idontspam on 18 February 2010 - 5:21am. There is a condition i think in the railways act which prevents non-IR entities from running rail services. It is phrased cleverly like the route should fall within a single logical city corporation or some such thing. This is why Bangalore metro used an amended mysore tramways act to allow them to build the metro. This is aIso why to execute HSRL BBMP had to take administrative control of the entire region that the route falls under. I am unable to articulate the exact provisions but one thing is clear, its not straight forward for the states to lay rail lines without violating some railway act provisions. Submitted by Naveen on 18 February 2010 - 9:41am. 1) Electrified double line exists - only between SBC to Whitefield (via Cant, Blore east, Byappanahalli & KRPuram - appx 24.0km). 2) Non-Electrified double line - fitted between SBC & Lottegollahalli (via Malleswaram, Yesvantapur - appx 10.8km). These are the only sections that have been doubled (34.8km). 3) Lottegollahalli to Byappanahalli (via Hebbal, Banaswadi - 12.2km appx). 4) Lottegollahalli to Yelahanka (7.0km). 7) Yelahanka to Dodjala (via Bettahalsoor - 12.5km). Thus, about 77 km of tracks need doubling (or trebling /quadrupling) to operate a CRS network, besides station improvements & rolling stocks, etc. Even if costs were of the order of 25crs /km, this would cost appx'ly 1925crs - still much smaller than the 9000 crs for 43km of Namma Metro. Track doubling between Yesvantapur & Nelamangala & onwards upto Tumkur has been completed. Also, track doubling between SBC & Ramnagaram has been completed (this information is from another updated SWR map). Submitted by Sanjeev on 18 February 2010 - 10:23am. From SBC to Lottegolahalli is already electrified and Yesvanthpur to Yelahanka is also electrified more then six months. Yelahanaka via Malleshwaram, Yesvanthpur, Lottegollahalli to Byappanahalli (via Hebbal, Banaswadi - 12.2km appx) is also electrified with single line. Now all trains originating from Yesvanthpur to Patna / WB ? Orissa are running with electric enginines only. From Yesvanthpur to Lottegolahalli , two track runs parallel but one goes to Yelahanak & other goes to Hebbal. Here SWR should create junction at Lottegolhalli, also plenty of land available from BEL next to station which can be used to bulid 4 platforms. Now Yesvanthpur to Lottegolahhali / Hebbal track is used mainly for parking goods trains going towards Tumakur / Mangalore almost 8-10 hrs daily. Railway has already sanctioned doubling of Yesvanthpur to Yelahanka & Yelahanka to Byappanahalli, I feel we may see the tendering process very soon on this. Even the total cost may be near 1900 Crore for CRS, with initial cost of say Rs 300-400 Crore CRS can take off within span of 6-12 months once State & Center decides to impliment. I thinks its time for Praja & all of us to write pettion to Railway Minister K H Muniyappa, Chief Minister of Karnataka , Transport Minister of Karnataka & SWR GM. Also we need to take this petition with all three MP's & 16 - 18 MLA''s of Bangalore. Other things is to make Commuter Rail Day similar to Bus Day. For Commuter Rail Day : Plan of action or Project can be created here with all input from Members & then take the same to MOS Mr K H Muniyappa & Transport Minister Mr Ashok and with SWR GM & DRM. We have already passanger trains running on particular root as discuused in earlier thread. We can ask SWR to add more coaches on the particula Comuter Rail Day & to stop the passanger trains in all stations. Request BMTC to run more buses from the Suburban Stations like Whitefield to ITPL Similarly to run special train from Kengeri to Devanhalli say at 7am & 8 am with feeder buses from Devanhalli station to BIAL. Submitted by Naveen on 18 February 2010 - 1:48pm. 1) Electrified double line - fitted between SBC to Whitefield (via Cant, Blore east, Byappanahalli & KRPuram - appx 24.0km). 2) Electrified double line - fitted between SBC & Lottegollahalli (via Malleswaram, Yesvantapur - appx 10.8km). 3) Lottegollahalli to Byappanahalli (via Hebbal, Banaswadi - 12.2km appx) - lines doubled, but only one line electrified. 4) Lottegollahalli to Yelahanka (7.0km) - single line, electrified, track doubling sanctioned. 5) Yelahanka to Byappanahalli (via Tanisandra, Chennasandra - 16.1km), single line, not electrified, track doubling sanctioned. 6) Byappanahalli to Anekal Rd (via Bellandur rd, Karmelaram - 29.0km appx), single line, not electrified. 7) Yelahanka to Dodjala (via Bettahalsoor - 12.5km), single line, not electrified. Even for this, a lot of augmentation might be necessary (such as more track additions, electrification, stn platform additions, rake interchanges, etc.). Submitted by Sanjeev on 18 February 2010 - 2:34pm. For Point No 3 : Yesvanthpur to Byappanahalli (via Lottegollahalli, Hebbal, Banaswadi - 12.2km appx) is a single line with electrified. a) Bidadi via Kengeri to City Stn & Yesvanthpur to Yelahanks - Approxi 49 km with electrifed double line except the single electrified line btween Yesvanthpur to Yelahanka. Here we have 11 stations, SWR can run EMU services. b) Similalry EMU can be started between between Bidadi via Kengeri to City Stn & Yesvanthpur, Hebbal to Whitefiled EMU services can be started with length of Approx 54 Kms, here also we have double electrified line except the Yesvanthpur to Baiyyappanahalli. Here how SWR can start EMU services on electrified Double line with distance of 40- 50 Kms. Its basically State & Railway should agree leaving Egos & work for CRS so that Banaglore Citizens will get the better Transport fascility with alternate transport options of CRS, BMTC, METRO. Let the frequency of 45-60 Minites during morning & evening with 4-5 schedules during starting. Then after the 6-12 months,with further investment, full fledge services can be started. Coaches for this CRS can be sourced from BEML as they have now experience for METRO coaches on Broad Gauge line for Delhi METRO pHase-1. If we think for full fledge CRS, its going to be in dicussion. Take the case of METRO, its going istart n phases, similarly CRS can be in three phases. Phase-1 to start immeditaly with above three options. Phase -2 Increase the frequency to 15 Minites after agumenting track & plaform capacity. Submitted by Raghu Nandana M on 18 February 2010 - 10:52pm. We hardly see any bus services to many of the above listed stations and is one of the major drawbacks for commuters not using commuter rauilway systems.The transport minister should seriously look at integrating bus & train services in bengaluru.We hardly see usable of bicycle as in chennai where the parking lots are filled with bicycles. They should start on priority with construction of new EMU/DEMU train yard as an immediate priority as we see the pit lines and railway tracks filled with capacity in the various city terminals. Submitted by Naveen on 18 February 2010 - 11:13pm. a) Kengeri-SBC-Yesvanthpur-Yelahanka (30.0km). Track between Yesvantapur & Yelahanka is single electric, rest double electric. b) SBC-Yesvanthpur-Hebbal-Byappanahalli (23.0km). Track double electrified, except between Yesvanthpur & Baiyyappanahalli, which is single electrified. 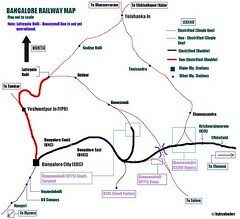 c) SBC-Cant-Byappanahalli-KRPuram-Whitefield (24.0km). Track double electrified throughout. Submitted by Naveen on 18 February 2010 - 11:26pm. They should start on priority with construction of new EMU/DEMU train yard as an immediate priority as we see the pit lines and railway tracks filled with capacity in the various city terminals. There is overcrowding of trains, no doubt - this was my impression too. However, capacities are coming up with Binny mill land for SBC stn /depot & NGEF land for Byappanahalli stn /depot, & these should reduce congestion, & assist in operating a Commuter rail service for the city. Agree that integration of bus & parking lots at various local stns is a must, if CRS is to be operated. Submitted by idontspam on 19 February 2010 - 2:19am. We need to draw a distinction between Commuter and Circular rail. I hope we are not using it interchangably in the discussions. Submitted by Vasanth on 19 February 2010 - 9:56am. Commuter Rail route suggestion on map. With this route, most of the places can be covered with just 1 changeover. Circural Rail - Where ? Submitted by Naveen on 19 February 2010 - 10:28am. We need to draw a distinction between Commuter and Circular rail. Are you optimistic about a new circular rail, or are you referring to the existing tracks ? Building completely new circular rail tracks seems doubtful & is highly unlikely (especially after the failures of circular rails in much bigger cities - Delhi & Kolkata). b) From Bellandur rd upto abt Doddanekundi on the Selam line - appx 5km. These add up to as little as 11km (out of some 62km circumference - below 18%). Submitted by Sanjeev on 19 February 2010 - 4:47pm. CAG Report which was submitted during June'2006 for the DEMU services of SWR. CAG report indicates that SWR has incurred loss of 0.67 Crore by operating DEMU services between SBC to Whitefield & SBC to Chikbllapur. The utlization / traffic volume on this DEMU was only 10.54% & 15.91% . Any one has idea / aware on these DEMU services as adversly indicated by CAG report. As this type of report may be coming in the way for CRS starting . This is due to non-planning or awarness to public by Authorities. Also their may not be any feeder services provided for this DEMU by BMTC. Submitted by Naveen on 19 February 2010 - 4:17pm. Excerpts from the CAG report (quoted below) reveal contradictions --- On the one hand, they claim that they had been trying to meet social commitments, & soon after, they add that the city, with it's high growth should be the first choice for DEMU service. Why didn't it work then ? I think there are a number of reasons. Awareness is a key factor as is image. When one adds lack of proper access to stations with bus services, patronization levels drop dramatically. Some publicity & good connecting bus services would have been sufficient. The railway minister's job does not end with just getting new trains - I think he is also required to push the machinery that arranges peripheral services that feed these trains. When the matter was taken up (December 2004 and March 2005), the Railway Administration contended (August 2005) that cost benefit analysis based solely on monetary factors cannot be the only tool for justifying a train service. Railways have an obligation for meeting the inescapable social commitments to the development of backward areas. Running of trains to meet the larger national interest in backward areas/ transport disadvantaged areas is an issue decided by the Railway Board. Zonal Railways have to follow the instructions of Railway Board, which has a wider perspective of traffic planning. Moreover, as Bangalore City is expanding faster in the suburban areas, it has the highest density of commuter traffic and, thus, deserves to be the first choice for DEMU service. Railway Administration’s contention is not acceptable in view of the provisions contained in Chapter II of the Indian Railway Financial Code, Volume I which require clear financial justification showing net gain to the Railways after meeting average annual costs and working expenses for any fresh investment. Introduction of new services must pass the test of financial remunerativeness as prescribed in the Indian Railway Financial Code, para 205. Moreover, running two small composition of DEMUs did not address the transport related problems of the growing population of Bangalore City as many other express/ passenger trains run on Bangalore – Jolarpet section and running of any additional train was found to be financially unviable by Commercial Department. The matter was taken up with the Railway Board in September 2005. Their reply has not been received so far (December 2005). Submitted by idontspam on 20 February 2010 - 10:30pm. I was referring to the existing tracks. But Circular is a term being used by some authorities in the press reffering to the same thing we are discussing but only within city limits, as Commuter trains generally connect suburban towns. So, we are talking of connecting Byp to Ypr at 2 min frequency akin to a metro in the same breath as running 20 min trains to tumkur & dodballapur which may or may not pass through the same stretches. Obviously we want both but there is a distinction. Submitted by Naveen on 21 February 2010 - 8:39am. I doubt even the Metro running at 2 min frequency. 6 or 7min is more likely, just as most metros do. SBC-Ypr-Byp & SBC-Byp-WF can be run at about 12-15 min. Ken-SBC-Ypr-Yelahanka can be at about 30 mins. Tumkur, Devanhalli & Hosur could be once an hour - might not see too many commuters even at hourly intervals since carrying capacity will be higher than Metro - train per train. Anyway, I doubt if a CRS for Bangalore will materialize at all. 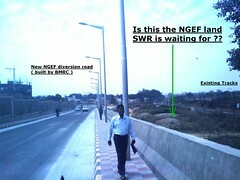 SWR available capacity for Bangalore city ??? Submitted by Sanjeev on 22 February 2010 - 5:35pm. As SWR is keepon claiming City tracks are over loaded Once we study the Train timings of summer spcial trains announced by SWR, its very clear SWR is having spare capacity to run more intercity trains. 1. YPR to Shiradi Train No : 0685 Dep at morning 7:30 from YPR via Yelahanaka on Tuesday. Here the same could have been used to run local trains between Kengeri / SBC / YPR via Yelahanak to Devanahalli / Chikballapur. In return direction, train is reaching YPR at 8PM on Thursday. So here also SWR could have planned Local Train starting at 7PM from Devanahalli to Kengeri. 5. YPR-Howrah Duronto Exp Train No : 2246 leaving YPR at 11:15 on Sunday and in return direction Train No : 2245 arriving at YPR on Saturday at 4 PM. This was announced after the budget. So one can see how SWR is fooling all of Bangalore Citizens on Local Trains / CRS. One more reason is Efforts State, they are blaming Center & Center blaming state. Who & how much funds required for CRS. Hence SWR officers are running more trains to WB / Bihar / UP / Kerala. Above facts show that SWR can start immediately many CRS / Local trains even during the peak hours. Submitted by vlnarayan on 22 February 2010 - 10:24pm. The real problem again is political will from the state, neither the CM puts in a thought nor the MoS for Railways, to make matters worse both are in different parties and they always think the other will derive the mileage of any success.. Even if MoS Muniyappa can get the CRS cleared for Bangalore, again the cost sharing will come into picture for which State needs to pump the money atleast 50-50 basis. State govt needs to come out of the blame game and be proactive here. Will CRS work with few trains ? Submitted by Naveen on 22 February 2010 - 10:38pm. Agreed that SWR whilst claiming to be overloaded, seem to have 'space' to accommodate new trains inbetween other inter-city departures, but will CRS ever work with a few sporadic trains thrown in between only where possible ? I think CRS would need regular departures, say one each half hour or one each hour for it to to pick up & sustain it's patronization by regular commuters. If a few trains are started here & there to suburban destinations, I doubt if it will be of much use for regular users since the service may only suit the rare /non-regular inter-city kind of travel - this had already been tested & had failed once, isn't it ? Submitted by idontspam on 22 February 2010 - 10:50pm. Absolutely, piecemeal efforts will result in excuses for discontinuing. Its not just the trains, its the platforms, the ticketing, the feeders, the timetable, the scheduling, the interchanges the whole deal. Submitted by n on 22 February 2010 - 11:17pm. The state does seem to be constrained against building / operating rail systems as per the Railways Act unless it can be proved to be a tram (based on a hurried look at the relevant sections - 2.31, 16 and 20 respectively). And, Railways are losing money for lack of feeder service as per the CAG article. Witness feeder service being run by Delhi metro than the bus companies. Doesn't this situation ideally lend itself to a 2-way MoU? The State govt. can assure feeder service (by KSRTC) and the railways can allow part ownership (some routing, frequency etc.) by the State on limited (suburban, circular) services. BMLTA is the perfect state liaison and coordinating agency. Just needs the push (most likely by state govt.). Submitted by Sanjeev on 23 February 2010 - 9:15am. The debate to have local trains / CRS between public, State & SWR is going on for more then 10 years & 3-4 times RITEs has submitted report on CRS. Amount spent on RITES study any one has idea??? 2. Now we have too many cooks : IDD, BMLTA, BMTC, METRO, HSRL, Mono Rail, SWR, BMRDA. Here I feel BMLTA has moe role to play on CRS, but they do not have any authority. 3. SWR has not developed any stations in last ten years in Bangalore except 2-3 stations : Kengeri, Chikkabanavara and to certain extent Yesvanthpur. Now SWR wants SBC & Byappanahalli to be developed as world class stations. This will not happen for next 4-5 years as SWR officers are interested to run trains for Bihar, WB, UP, Kerala. Also SBC will not start as Binny mil land is under court case. 4. Byappanahalli wcould have been developed by SWR by now as an regular station, which could have helped. Also Yelahanaka is really in bad shape & it looks like some village station. Why SWR does not own the developement of thiss tation, Railway are developing all stations in Bihar, UP, WB. Next to Yelahanka, Railway has its own factory Wheel & Axle Plant. 1 As Mejestic area will get disturbed over the period of 2-3 years for METRO & KSRTC Bus Stand, where is the alternate transport facility for this. 2. NH-7 raod widening by NHAI for 22 Kms over the period of 3-4 years. 4. METRO work Phase-1 & Phase-2 at diiferent parts of city will have effect on public transport system. 5. Ever growing traffic in city will further have problem. Where is the alternate mode of Public Transport system for the above for next 3-4 years. In the process, we see more Intercity trains starting to Bihar, UP, WB, Kerala & further SWR will take stand that it is not possible to even start few local trains. If the SWR can start few local / CRS trains in the peak period say four shuttle services in the morning between 7 to 9 with frequency of 30 Minites & same way in the evening four shuttel services between 4-6PM. , this will help in bringing pressue on Raod.. Say even 20000-30000 passengers can start using the CRS / Local trains, Take the case of MMTS at Hyderbad, now the ridership is arround 75000 & they are planning for 2nd Phase with further investment of Rs 400 Crore, here SCR is forcing state to come forward.. In the same way CRS / Local trains can be started in Bangalore. Other wise if seperate tracks to be needed for CRS & full fledge service required , then let us be ready to invest Rs10000 Crore, which will be in DREAMS only. Submitted by idontspam on 23 February 2010 - 10:27am. Metro built under municipal limits of Bangalore took shelter under the mysore tramways act so they did not have to get it built by IR. This also means metro cannot service areas outside BBMP limits. I wonder how Delhi Metro can go to Gurgaon & Noida then. This clause needs to be altered so states can build their own railways and own it as long as it doesnt interfere with IR and maybe confine itself to the state instead of municipal limits. So effectively the alteration of clause from municipal to state and removal of the word Tramway will allow decontrol of the railways from IR stranglehold. There is no need for them to monopolize the services like this. On a lighter note 2.31 also reads (ii) lines of rails built in any exhibition ground, fair, park, or any other place solely for the purpose of recreation. Classify Bangalore city a theme park because it is one hairy ride anyway. In which case you can build mono rail for the joy ride. its a toy train anyway. Submitted by Naveen on 23 February 2010 - 10:31am. Sanjeev - your frustrations are shared by many of us. Unfortunate as it is, the railway structuring at central level is such that local realities & needs are often ignored, despite the many railway sub-divisions. As we know, their focus is primarily on inter-city or inter-state travel. New trains to /from Bihar, WB, UP, Kerala, etc are probably a result of demands from those states for direct connections to the south & to Bangalore, since these had also been neglected over the decades. Even direct trains between Kolkata & Bangalore had not been available earlier & one had to change over at either Chennai or Guntakal. At least inter-city travel has improved a great deal, now. The traffic disruptions that you mention are for putting in place much better exclusive track train system/s that will provide long-term, permanent relief for commuters, based on data. Though this will take some time, it is perhaps worth investing in & waiting for. In the interim, BMTC buses can do the job. I was on ORR /Kundalahalli yesterday at peak hour evening & saw the hundreds of buses going full, ferrying people to various parts of the city. Increasing the number of buses & schedules alone might be a much better option for providing temporary relief than the operation of a hastily built CRS that will have too many restrictions in operation such as too few schedules, limited no. of stations - many of which lie away from normal commuter traffic flows with no proper access to stations, etc. After experiencing CRS at Chennai recently, I am firmly of the opinion that planning a CRS based on existing tracks or new tracks fitted only where possible, will never work. For the system to succeed, the focus has to be firmly on ease of travel for commuters based on studies & must never be based on where physical assests exist or for the ease of construction. Though we are fortunate that a couple of SWR tracks run through the city & could be used for mass transit, running a CRS as things stand is easier said than done since the question of arranging inter-modal transfers arise at both ends. Thus, unless buses are permitted into railway stations to pick up & drop off passengers, CRS may never work. As of now, none of the stations have such facilities. This will of course change with Byappanahalli & maybe other stns later. Submitted by idontspam on 23 February 2010 - 10:36am. I insist we deserve and need a real CRS with proper rolling stock, not get-the-monkey-off-my-back efforts. Submitted by s_yajaman on 23 February 2010 - 11:07am. Our agencies cannot even coordinate and provide decent footpaths to walk on in the centre of the city. And we actually think they will provide a decent commuter rail service. There is nothing in it for SWR to provide commuter rail service to Bangalore. Even the twice a day service to BIAL which was supposed to have taken off a few months back has not. This is realism and not pessimism. Submitted by silkboard on 23 February 2010 - 11:12am. It will be worth the effort to meet a few SWR and GoK people to get their 'official' versions. Lets also speak to few journalists, and help one paper or TV channel do a detailed report on CRS possibilities (feasibility is different from possibility). Such a thing would raise the profile of this issue/demand. Can try DNA, Express, Hindu, or TV9. Submitted by SB_YPR on 23 February 2010 - 11:56am. Just finished reading all the posts on this thread, and here are some of my thoughts. Second, as a corollary of the above, the only way to enable a CRS for Bangalore is on the Hyderabad MMTS model, with the State Government sharing half the cost. I am still not clear whether BSY & Co. are actually interested in this, particularly given that the State is already heavily investing in the Metro. Third, not all of the rail corridors in Bangalore, either in their persent state or otherwise, are suitable for suburban traffic movement. For instance, the Yeshwantpur-Yelahanka line passes through the BEL and GKVK campuses for a significant portion of its length. Likewise, the Yeshwantpur-Chikkabanavara line passes through mostly forested area or defence land beyond Jalahalli and does not serve any major population centres. Fourthly, the region around Bangalore still has large expanses of single line track without the doubling of which suburban services cannot commence. Baiyyappanahalli-Yeshwantpur, Yeshwantpur-Yelahanka and Yelahanka-Krishnarajapuram are instances. Some hope lies in the fact that the doubling of the latter two stretches (26 km in all) had been sanctioned in the previous budget at a total cost of Rs. 125 crore. Fifthly - and this point has been made many times over - intermodal connectivity at stations is an absolute must. Some stations (like City, Whitefield and Yelahanka) have bus stations in the close vicinity, others (Cantonment, Krishnarajapuram, Byappanahalli, Hebbal, Kengeri) are benefited by their proximity to a major road, and still others (Lottegollahalli, Nayandahalli, Kodigehalli, Banaswadi) lack connectivity altogether. Unless the gaps are filled up, the success of the service will be in doubt. It is a long shot, though, to expect any or all of these to materialise smoothly, particularly given the number of coordinating agencies involved (SWR, BMTC, BTP, BMLTA etc.). Short of hoping for the best, it would be a good idea for us (and the authorities involved) to identify areas needing improvement and lay out a roadmap towards achieving a final solution. Submitted by Sanjeev on 23 February 2010 - 12:04pm. BMTC playing feeder services to CRS on existing is not a problem. With few changes to BMTC root, further stations can be included for Local Trains. I agree completely, In the long run, we need Full Fledge services of CRS with frequency of 10 Minites. To come to this situtaion, we need to start some where & its already more then 10 years, things have not changed. Once we have this small services of four shuttel services in the morning & four in the evening in each direction, then awarness will come with Public & further things will start moving. With this was even State and Center can mobilze the required funds and Ridership will also improve over the period with all three BMT, METRO & CRS complimenting each other. Even as you sugested on increasing BMTC buses, as roads already are chocked, then how do we ensue the speed of travel, forget the compfortness of travelling. insist we deserve and need a real CRS with proper rolling stock, not get-the-monkey-off-my-back efforts. Then wait for the next decade 2020, we will get complet METRO, let us enjoy the further polluion, congested roads & increase in travel time. KRV has not raised issue till now on Local Trains or CRS. I agree on this. & we should explore this. They can make difference on this, but I am not sure they will do this??? Yes We can meet the people & push for the CRS . Submitted by Sanjeev on 23 February 2010 - 12:26pm. It will be worth the effort to meet a few SWR and GoK people to get their 'official' versions as suggested by Pranav. this is very much needed to make more public awarness & force the authorites make the things start. Call DNA, Hindu, Express, TV9, and other channels & news paper. Alos we need to file RTI with BMLTA, SWR, IDD & Chief Secreatry of GOK for the status of CRS. I have spoken to BMLTA, IDD & SWR DRM office, but the BMLTA is more positive. SWR Hubli is not giving any response on this. IDd is passing buck to SWR Hubli. DRM Bangalore is some what interested. Submitted by SB_YPR on 23 February 2010 - 12:25pm. four shuttel services in the morning & four in the evening in each direction on existing SWR traclk, already capacity is available with SWR. Services should be during peak hours only. Bangalore City station (and the rail corridors in general) are quite crowded between 6 am - 9 am and 6 pm - 9 pm (broadly what could be classified as peak hours) due to several arrivals/departures of long-distance trains. As such, I don't think it will be possible to run services during peak hours with the existing infrastructure. Submitted by Naveen on 23 February 2010 - 12:33pm. When the state is investing almost 11,000 crs on a metro system & is seriously considering expansion with a second phase & possibly a monorail system as well (all calling for huge investments), why would they pursue a CRS in the interim which they will have little control over & when overwhelming evidence suggests that such systems cannot be run efficiently within our goofed up bureaucratic setups & with so many agencies needed for co-ordination ? This is without mention of the land crunch which SWR has been facing for expansion of SBC station & their insistence on overloaded systems. I don't think there is much demand nor is there much expectation from the public for a CRS since they already know too well how such rail systems have been functioning in other cities, Mumbai excluded. Mumbai's dependence on suburban rail, as we all know is more to do with the city's N-S terrain & travel habits that have historically been established due to this - in fact, the city's suburbs were developed based on where rail tracks could be expanded, akin to Curitiba's BRT. Thus, comparison with bangalore would be incorrect. Action from the state for acquiring a CRS may start only after the Metro has been made operational. Submitted by idontspam on 23 February 2010 - 2:45pm. In which case they should allow the state to do it themselves. Lets ask SWR/muniyappa to go and campaign for the IR act 2.31 modification in lieu of us getting off their back or even easier provide IR land for the state to lay their own tracks adjacent, over, under their tracks. I am more interested in decontrol of IR monopoly so the state can lay their own tracks, it is a hassle to go behind this state provider to get anything done. Submitted by idontspam on 23 February 2010 - 2:52pm. No thats not how you solve problems. Get IR to deregulate and let go of monopoly over railways then either IR will implement CRS just to get you off their back or really let go of monopoly, in which case its easier to catch your local govt. THe former is very much unlikely, but the latter is very much possible. Like Manish has pointed out, suburban services will be hived off and new ones may not need IR approval. Submitted by Naveen on 23 February 2010 - 3:28pm. Exactly - Unless we find a proper, sustainable manner to meet operating expenses through revenues, there is no point in demanding CRS - & CRS, as of now is still largely an IR subject, though states may have funded it partially. Thus, fares have to remain low, revenues have to remain poor, & train systems /stations have to keep rotting away! The cities that have already benefited with CRS may seem to have been blessed, but the reality is that these rail systems are not maintained well, do not fulfill objectives & keep bleeding the economy. BMTC playing feeder services to CRS on existing is not a problem. With few changes to BMTC root, further stations can be included for Local Trains. This is not entirely true - many of the stations including important transit points such as Cantonment, Bangalore East, Kengeri, Gnanbharathi & Malleshwarm do not have bus stops close by. Some do not have bus routes that pass near enough. We are probably talking about 2050 now! The central govt's stanglehold on railways in the country will take a lot to break. They will never wrest control since IR has been a prized pocession for them to use in many ways to appeal to the masses. No harm in trying though, I guess. Submitted by rmb on 23 February 2010 - 4:30pm. If legal wrangle is the issue for starting a railway by state, how was KRC possible? IR was just a minor share holder in KRC and still continue to be so. Submitted by Sanjeev on 23 February 2010 - 5:25pm. As Manish mentioned about the Railway ministry may hive off suburban traffic operations. Also as mentioned by Naveen, We are probably talking about 2050 now on IR deregulations and let go of monopoly. With MoS MR K H Muniyappa from Bangalore, we have seen last one year, what Mamatha has allowed him to do. Even the Rajdhani announced last budget not yet started. Other wise BEML can participate in SPV. Lets say State 40%, Center / Railway 40% & BEML :10%, with FII's & public 10%. Here BEML can supply the rolling stock for CRS as BEML has gained expetise in MTERO Rakes on Broad Gauge line for Delhi METRO. Rakes can be as per METRO design for CRS. State will be more interested in BEML as the State will get more tax collections. This type of debate will keep on going for Bangalore may be for next one decade & Hyderabad MMTS is planning for phase-2 this year. Similalry in Karnataka we need CRS for Mysore, Managalore, Hubi-Dharwad If the Banaglore gets CRS, then it will help other cities of Karnatak for Locla trains getting. Submitted by idontspam on 23 February 2010 - 9:34pm. Not like that, it has to be a sustained campaign with possibilities discussed right here on the site itself. Lets work out a model and then present it. Ramesh's model on Bangalore Railway Corporation can kick of the discussions.